We went for a walk on the Vico road last Sunday. We parked in Dalkey and walked the hill to Killiney. It was lovely when the sun came out, and the ice-cream van at the top of the steps to the little beach was doing a brisk trade. 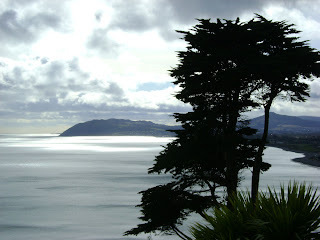 This is a view of Bray Head. Isn't it just gorgeous? If only we had warmer summers in this country, we would indeed think we are in Italy. Pancake Tuesday turned out better than expected. As I'm still on my dairy-free and wheat-free diet, we were not sure how it would work out for me. But good old Aine McAteer came to the rescue again. She has a recipe with spelt flour and water instead. And it was delicious - Brendan reports that it felt a bit thinner in the pan, but on the plate, I'm happy to say that it had a lovely springy texture, and it tasted perfect. With lemon and sugar of course! We had Mick and Blath over last night, and Brendan cooked a gorgeous Indian meal. We had a chicken marinated in yogurt for starters (mine was marinated in lime), with a mango salad, and 2 main courses: a pakistani red curry with chicken, and a parsi fish white curry, with Brendan's special potatoes (don't ask me what's in them - I have no idea) and a gorgeous dahl with green beans and tomatoes. I think the red curry was particularly nice - it's quite fiery when you put it in your mouth first, but then the flavours take over from the chillies and it settles very nicely indeed. We had a lovely evening, and Willow got on great with Mick and Blath, who are cat lovers too. I just saw on my Blogger Dashboard that I have 648 posts! I could publish them all as a book! When I die, I want a computer screen connected to my grave, with a slideshow of my blog. Because it's very me. But that's not what I was going to talk about today. While I've started another version of the poppy painting, my time this week has been spent watching the telly. Well, not really. I do work every day after all, and sometimes as late as 7pm even, so I've only got a couple of hours of free time in the evenings. But the free time I have has been mostly spent watching TV series. Lost, on the other hand, is moving, back and forth, at fierce speed. I think this is the 5th or 6th season, and it still fascinates me. I still don't know if Ben should be trusted (probably not). And who was the character who talked to Locke just before he pushed the wheel? Was it Jack's (dead) father? I think that's who it is, and I'm looking forward to finding out more about it - all in good time of course. And then, there is Brothers and Sisters. Which I watch on 4OD on Saturday afternoons. It's got far too much drama, but I love it. Will Kitty's mariage survive her husband's political ambitions, will Sarah's new venture into the dot com world liberate her somehow, will Nora meet Ryan? And of course we're watching Buffy the Vampire Slayer. Brendan gave me the full boxset for our anniversary, and we're on Season 2 and enjoying every moment of it. Second time around of course, as we were keen followers of Buffy in the old days. I can't quite remember when it first came out. But Willow is nearly 9 years old, so that gives you an idea. No wonder I'm making so little progress with my painting these days! Brendan and I have a fondness for Nanci Griffith - she is a very good live performer, and always has nice rambling stories to tell about her songs. She was performing at The Helix in DCU last night, and we went to it. It was our first time at The Helix - nice place, not the most convenient for us unfortunately. The concert was great - she played plenty of the old favourites, like Trouble in the Fields, Ford Econoline, It's a Hard Life, Love at the Five and Dime, ... She was playing with minimum accompaniment, but it worked well, though the big stage could have done with a bigger orchestra. The big shock, I guess, is that her hair is grey! The last time I saw her at The Gaiety, I would swear her hair was still black, and it's not that many years ago. Brendan and I felt that the audience was quite old - of course, we still feel like we are 19, so all those 40-somethings and 50-somethings are ancient! One thing I love about Nanci Griffith is how comfortable she is on stage - when she introduces a song, it's like she's having a chat with a friend over tea and biscuits. She is touring so much (look at her website, on the Tour Archives page! ), it's no surprise she is so cosy with being on stage. There is a lovely video of Nanci and Maura O'Connell singing Trouble in the Fields on YouTube. I highly recommend it. In the end, I got my poppy painting done fairly quickly. It only took me a couple of hours to do the poppy itself, if even that. It's not as transparent and vibrant as I would like it to be, but I can't add more glazes or it will become dull, as the blue violet lines lift easily with each layer of violet red. And surely we don't want that. I'm now planning to do another version of it, following inspiration from Shirley Trevena's book taking risks with watercolour. By the way, that's it, I've had enough of Google Chrome. I decided to give it another try today, using Blogger. You'd think it would all work together, being a Google product too. But Chrome froze when I clicked to add a picture to my post. Those boys and girls at Google shouldn't release a product to the wider public without the basics working! It doesn't say on the download page that it's a Beta, but it certainly feels like one. Chrome is supposed to work faster than other browsers, but it's not much good to me if it freezes in the middle of my work! On Sunday, we decided to try out Monsoon in Rathmines. It is part of the same chain as Indian Summer, so we knew the food would be good. It was lunchtime and the Sunday buffet was on. Absolutely delicious, all you can eat! And great value @ €37.90 for the 2 of us. I must find out if Indian Summer do a Sunday buffet too. PS: I'm going to give up on Google Chrome, until they make it workable - I can't get the Flash Plugin to install. Whenever I try, it tells me I need to close Chrome, but then Flash still won't install. And it's frozen on me a few times while writing this blog and opening simple websites. It's not good enough. I expect better from Google! I did get a bit of time to paint this weekend. I spent most of that time mixing colours, as I'm completely obsessed with colour theory at the moment. It's fascinating stuff, once you get into it! But I'm also making some progress on my current project - a lovely pink poppy. I've been working on the background for the last couple of weeks now. And I did ditch some of the colour theory principles in the process, in favour Elizabeth Kincaid's advice instead. I was going to use my ultramarine to create some dark greens, but I found that the one I have is not transparent enough for glazing. 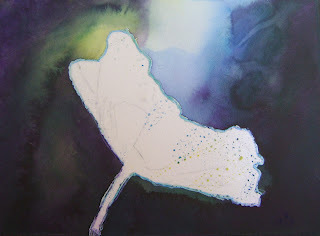 It leaves big deposits of paint in the hollows of the paper, and doesn't give the dark effect I was hoping for. I ended up with patchy mud. So I used good old reliable vanadium yellow and phthalo blue and some dioxazine violet. Phthalo blue gives really rich darks when you apply a thick wash - exactly what I wanted. I've now taken the masking paper and fluid off, and will be starting on the veins in the poppy. I'll need to do a few dry runs first, so don't expect results too soon! Another movie that crosses over the genres: Underworld is a story set in a world where vampires and werewolves roam the world, with, it would seem, very little interest in normal people, even just to drink their blood. They are so busy killing each other, that there is no need to deal with humans - apart from one human, that is, Michael, whose blood has peculiar properties. Like the last movie I reviewed, Alien vs Predator, this is not a fantastic movie, but the action went at a good pace, the special effects weren't bad, and there were a couple of good actors in it, including Michael Sheen who played Frost in Frost/Nixon. We knew that werewolf looked very familiar - I just couldn't place him, until Brendan checked his name on the internet! By the way, this was classified as horror - I didn't find it scary at all. PS: I tried to view the Underworld website in Chrome, Google's browser, but it wouldn't work for me. I got a message telling me to download Flash, but the versions of Flash didn't include Chrome as a platform. When I tried anyway, it told me to close Chrome, and then the Flash install froze after that. So I'm back to Internet Explorer! Thursday's snow hasn't melted yet, despite the blue skies and sunshine. The road in front of our house is still icy, and the footpaths are treacherous. Most of the main roads are completely clear, though. The forecast is for possibly more snow tonight, which I'm not looking forward to. But Airfield was lovely, giving us plenty of photo opportunities, and plenty of fresh clean air! We watched Alien vs Predator on the telly a couple of weeks ago. It's not half as good as Alien (I can't comment on Predator - I don't think I ever saw that movie), but passable enough to keep me watching (and you know me, if I don't like a movie, I won't put up with it). I couldn't find a decent website about it. On the other hand, the Wikipedia entry for Alien (link above) is rich with design and production information, telling you all about how they did the special effects for the Alien eggs, and other gory details. Apparently, there is a sequel to Alien vs Predator. I wouldn't hurry to the cinema to see it, but if it's on the telly and I'm bored, I'll probably watch it. It's not something we see every year - Snow. 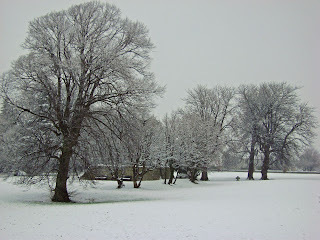 It snowed a good bit on Monday - a good bit being relative, of course, I'd say 3 or 4 cm. We stayed indoors all day and took it easy. Things improved on Tuesday morning, but then got bad again in the late afternoon. Lucinda was stuck in traffic for four and a half hours driving home from work. I'm glad I didn't have to face that! Needless to say, our yoga class was cancelled. Then yesterday, it all cleared. We got rain and there was no snow left on the ground, bar the last remnants of a few strong snowmen. I really thought it was all over for another 5 years! This morning started dry and clear, but then, around 11:30, it started to snow quite heavily, and the roads were a mess. It took me 50 minutes to get back from a customer in Templeogue, mostly in first gear (probably really bad for the car, but the traffic was crawling). It's 2pm now and it's just started to ease, but the forecast is for snow for the next few hours. We'll see how it goes. 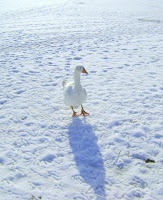 I do love the crunchy sound it makes under the feet and the peaceful feeling of a snowy landscape. But I hate the consequences: the bad roads and slow traffic, and the fact that the whole country grinds to a halt. I've just finished (re-)reading Icefields by Thomas Wharton. It's a slow-paced story about glacier exploration, unattainable women, self-absorbed men, and a strange shape in a crevasse. It was compellig somehow, but there isn't much story, most of the characters remain a mystery throughout, and the ending is too abrupt - maybe like the end of a glacier. So, not an entirely satisfactory read, but I won't be throwing it away all the same. What I didn't realise until just now, is that it's set in a real location, now a national park called the Icefields Parkway. It looks like a beautiful spot. Maybe we should go see it some time! 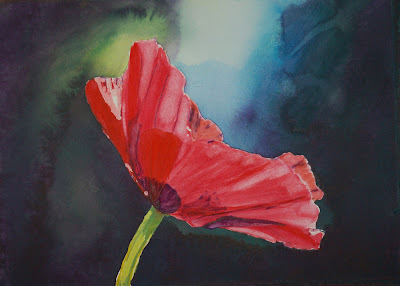 I'm at the preparation stage on my next project, a lovely pink poppy with a dark background and dashes of sunlight. Of course, this is just the excuse to delay putting paint to paper, except that I'm actually putting plenty of paint to paper, just not on the poppy. 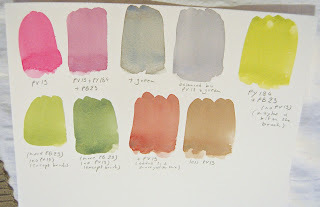 I also like the mid-intensity greens made with Ultramarine and Vanadium yellow, and the greys and browns created when you add Permanent Rose to the mix. Subtle - but not dull. I might actually use them for the really dark part of the background to the poppy painting. I'm just not sure how they'll work out - the background is really dark, so I might have to do several glazes to get the effect, but I'm afraid the greys will look too dull if I add too many layers. I guess I'll just have to try it! Don't you think these colours are to die for? We went to Frost/Nixon yesterday. An excellent movie that I would recommend to all who are interested in politics. Actually, you don't need to be into politics to enjoy it - it's a fascinating study of what makes people tick, and how they interact. Frank Langella's portrayal of Richard Nixon is excellent. In a certain light, he almost looks like him. This was a very entertaining movie - it was a serious subject, but there was enough humour in it to keep me engaged. The action kept moving towards its inevitable ending, with enough detail of the period to keep the eye interested (without being a distraction - the wall paper in the hotel room reminds me of the wall paper in my own bedroom back home, though!). The movie was made by Ron Howard, who, you may remember, played Richie in Happy Days! He's now a well-respected director (apart from The Da Vinci Code, that is!). There is plenty of information on the website if you're interested. PS: I found the picture at the top on an Australian website. I love the smell of face and body creams, shampoos, shower gels and soaps. When I was small, I hardly had any sense of smell, my nose being battered by constant colds. But now that I can smell, I just love it. I will often smell beauty potions in supermarkets and shops. I cannot buy perfume without knowing whether I will like or hate its scent. Weleda Sea Buckthorn range: I got a sample handcream last year, and I longed for its smell for months. I now have the body wash and a big tube of handcream, part of a Christmas gift pack. I didn't know what Sea Buckthorn was, until just now, as I've checked it on Wikipedia. The smell of the range is enhanced by orange, grapefruit and other citrus oils. A warming and invigorating feeling, particularly nice under the shower. Lush Pied de Pepper footcream: I'm a big Lush fan. Their bath products are to die for. I've recently opened a fresh jar of Pied de Pepper Foot Lotion. It's spicy and warm. The main scent I get is cinnamon and cloves. Brendan got the vanilla (a vanilla pod decoction being the main ingredient, he was right there). It does wonders for hard skin. The colour is the only thing that puts me off a bit- it's a dirty bubblegum pink. Avalon Organics Rosemary deodorant: I used to buy Thursday Plantation Tea Tree Oil deodorant, but my pharmacy tell me that they can't get it anymore. I'll have to have a look somewhere else for it. It's really good. In the meantime, I've bought a Rosemary deodorant from Avalon Organics. A gorgeous wake-me-up smell for the mornings. ... according to the Irish calendar, that is. It hardly feels like Spring, with cold weather forecast for the next few days, and even possibly snow, as the Easterly and North Easterly winds will bring us cold Continental and Scandinavian air! 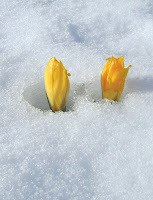 But the buds are budding, the days are getting longer, and there is a hint of heat in the sun. I won't put away my winter coat just yet, though!